St. Charles City Hall is located at 2 East Main Street, St. Charles, IL 60174; phone: 630-377-4400. Photo: Joel H. Hubbard House (Ferson-Butler-Satterlee Home), ca. 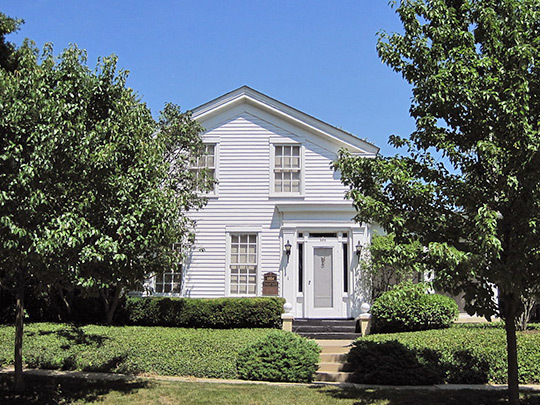 1854, 304 North 2nd Avenue St. Charles, IL. The Historic District was listed on the National Register of Historic Places in 2011. Photographed by User:Teemu08 (own work), 2011, [cc-by-3.0 (creativecommons.org/licenses/by/3.0)], via Wikimedia Commons, accessed June, 2014. St. Charles was originally the site of two summer camps of the Pottawatomie Indian tribe who camped near the shallows of the Fox River where they forded and fished the river. Settlers arrived in the Spring of 1834, when Evan Shelby and William Franklin from Indiana laid their claim on a tract of land high on the east river bluff, near the current intersection of State and Fourth Avenues. Settlers were attracted to the area's varied natural setting. To the west were extensive prairie lands while dense woods grew on both sides of the River to the north. By the mid-1830's, a bridge had been built, as well a saw mill, carding mill, and grist mill. A general store was built at East Main and First Avenue in 1836, an event that spurred further development. The town was initially named Charleston, but later changes its name to St. Charles in 1839 after a dispute with another town in Illinois with the same name. The City limits have undergone two major expansions, the first in 1856 and the second nearly a century later in the 1950's. In the 1950's the industrial focus moved from the center of town to the outskirts. This allowed for larger sections of industrial development on undeveloped land and left the downtown area to develop in a more conventional fashion. Main Street during this time period became a dominant organizing feature and the City's primary commercial arterial. Houseal Lavigne Associates, LLC for City of St. Charles, IL, 2013 Comprehensive Plan, www.stcharlesil.gov, accessed June 2014.